How many secateurs do you have? 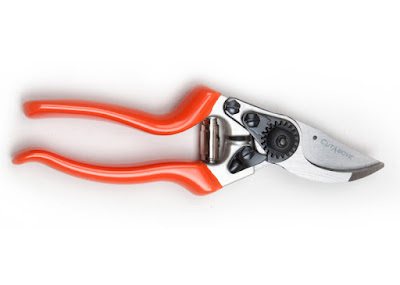 If that’s you, then you’re in for a surprise because secateurs are like dressmaking scissors, or side cutters in the blokes shed, and that is you probably need more than one for the different jobs you might have in the garden. So just in case you’re in the market for a new pair here’s some timely advice. The real interest gardener might have anywhere between 2 to 4 pairs of secateurs while the casual gardener may make do with one. 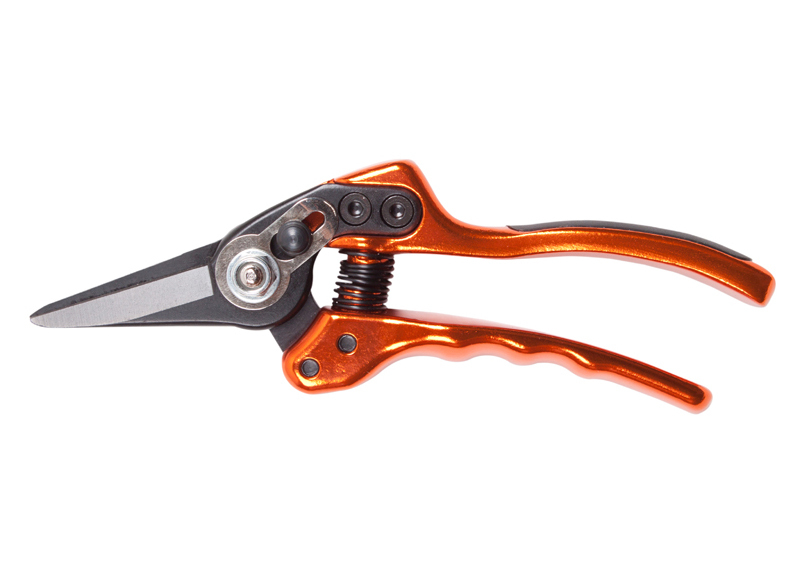 There were plenty of tips for updating your secateurs or adding one to your garden tool kit. We only briefly mentioned left handed secateurs and cut and hold secateurs which are helpful for pruning roses so that cut branch can be put directly into your garden trug or whatever you’re using to put the prunings in. There are also a new type of spring that looks like a coil rather than the traditional veloute spring for secateurs. Florists use them day in and day out so look out for secateurs with those types of springs. Looking like something that dropped from outer space, today we’re growing a horned melon. 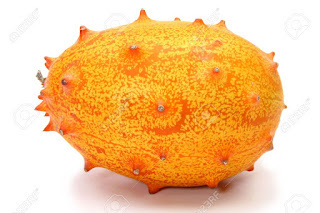 Scientifically, African Horned Melon is Cucumis metuliferus, but to us gardeners it’s horned melon or kiwano, also African horned cucumber or melon, jelly melon, hedged gourd. Like other melons it’s an annual vine in the cucumber and melon family, Cucurbitaceae. 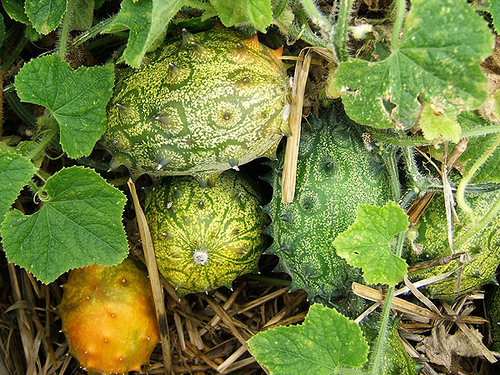 Why should you grow a horned melon? For those who like to grow strangely different things this one’s is for you. Its fruit has horn-like spines, hence the name "horned melon". The ripe fruit has yellow-orange skin and lime green, jelly-like flesh with a tart taste, and texture very close to that of a cucumber. In fact as its seeds are found throughout its flesh, not just within a seed cavity, it’s more like a cucumber than a melon. The fruit's taste has been compared to a combination of cucumber and zucchini or a combination of banana, cucumber and lemon. It is also said to taste like an unripe, watered-down banana. A small amount of salt or sugar can dramatically change the flavour. Some also eat the peel, which is very rich in vitamin C and dietary fibre. Horned melon is native to Sub-Saharan Africa where it’s also a traditional food plant in Africa. And it’s one of the few sources of water during the dry season in the Kalahari Desert. So How Do You Grow This Thing? Plant the horned fruit seeds directly into the garden after all danger of frost has passed and temperatures are consistently above 12 C.
Optimum temperatures for germination are between (20-35 C.
Plant seeds at a depth of 1 ½ - 2 ½ cm, in groups of two or three seeds. Allow at least 30 cm between each group. You can also start the seeds indoors, then plant the young melon plants in the garden when the seedlings have two true leaves and temperatures are consistently above 150C. Water the area immediately after planting, then keep the soil slightly moist, but never soggy. Watch for the seeds to germinate in two to three weeks, depending on temperature. Be sure to provide a trellis for the vine to climb, or plant the seeds next to a sturdy fence. Just like for cucumbers water your horned melon plants deeply, giving them at least 2-3 cms of water per week, then allow the soil to dry between waterings. A single weekly watering is best, as shallow, light irrigation creates short roots and a weak, unhealthy plant. Water at the base of the plant, if possible, as wetting the foliage places the plants at higher risk of disease such as powdery mildew. Cut back on watering as the fruit ripens to improve the flavour of the fruit. At this point, it’s best to water lightly and evenly, as excessive or sporadic watering may cause the melons to split. When temperatures are consistently above 230-240 C., the horned melon plants will appreciate a few cms of organic mulch, which will conserve moisture and keep weeds in check. The green-yellow skin turns a bright deep orange when ready to harvest, and the pulp resembles lime-green Jelly. The easiest way to eat a horned melon fruit is to cut the fruit horizontally, through its centre. Take one piece and squeeze its pulp into your mouth. The seeds are like cucumber seeds and are edible. Horned melon growing is that easy. Give it a try and experience something different and exotic in the garden. The seeds are available online and I’ll post the links on my website/blog. The Horn melon consists of over 90% water and is rich in vitamin C.
It is also a source of iron and potassium and vitamin A. Plus it only has 103 calories. As for cooking with it, you can scoop out the inner fruit and toss it in fruit salads or use it as a colourful garnish. 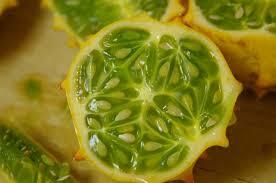 Kiwano or Horned Melons are also excellent in exotic drinks. How about a minty gin-and-champagne horned melon or kiwano (it’s other name) cocktail! 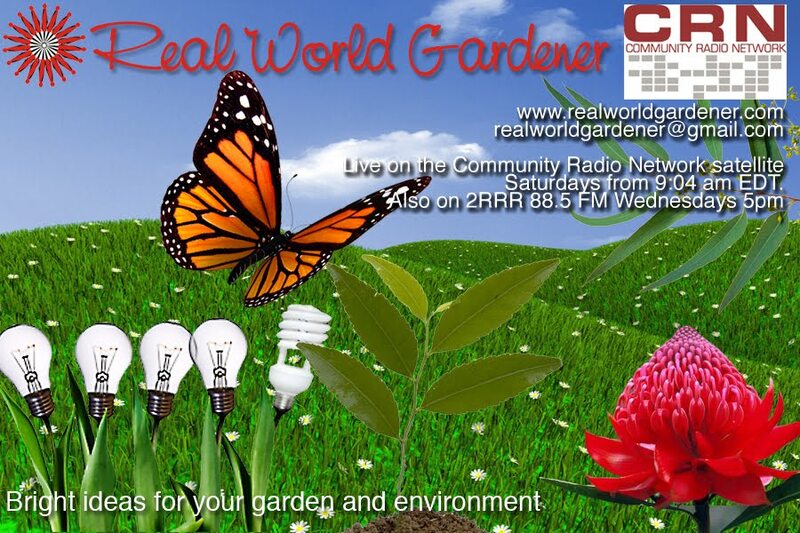 A couple of weeks ago we started a new series on scented plants for your garden. So many plants are lovely, with beautiful blooms, but only a smaller section of these also include a wonderful fragrance. 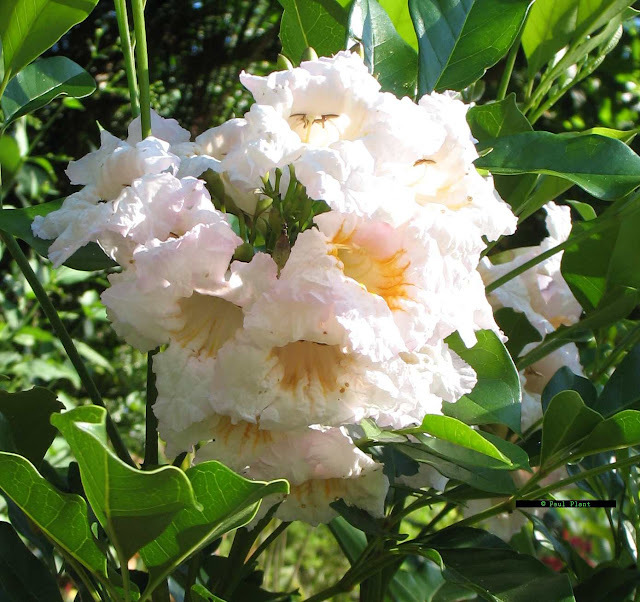 When it comes to shrubs you probably know Gardenias, Lavender, and last week we talked about Jasmine, and of course there’s that ubiquitous Murraya that everyone seems to have.What about something different, something surprising. .Don’t miss out on planting scent in your garden. Peter mentioned the old fashioned Rondeletia that belongs to the shrubbery of old. .Quite tall but with wonderful scent and much less trouble than Gardenia. 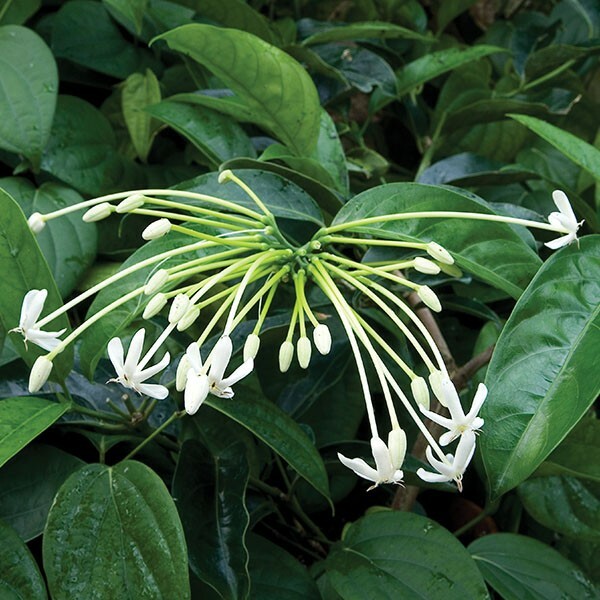 For those looking for an alternative to the cloying scent of Murraya paniculata or Orange Jessamine, choose the Japanese Needle Flower or Posequeria longiflora which is very tough and eventually grows to 3 metres. However it can be pruned to much less than this. There was also Radermachera "Summer Scent." This is a low alternative to Murraya. Why not grow some or all of these plants so that you can turn your garden in to a perfumed paradise all year round. These next plants are quite low growing but are the sort of plant that flowers a lot and you can stuff here and there into rockeries and nooks and crannies in your garden, or if you like hanging baskets, they’ll trail over these. They have a bit of a strange name so I’m surprised that marketers haven’t coming up with something more inspiring. 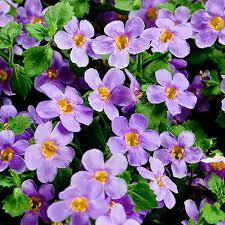 It turns out that Scopia is just a name for a series of 16 varieties of Bacopa. Among them are the Gulliver varieties, which have very large flowers. If you’re area’s climate is really warm, then Bacopa doesn’t like to grow there so much. However Bacopa does grow well in dappled and semi-shade so there’s another choice for all those gardeners that either have different amounts of sun and shade in their garden where they need a plant that can cope with both. Wattle Will Goldilocks Do with Juniper?